Interests - Watching cartoons and playing with toys that light up and play music. Able to use hands? - Yes - James has very sensitive hands so touches toys but does not hold anything. James was born 4 weeks early due to a placental abruption and spent his first week in neonatal care due to his blood sugar levels and the fact he was deprived of oxygen at birth. 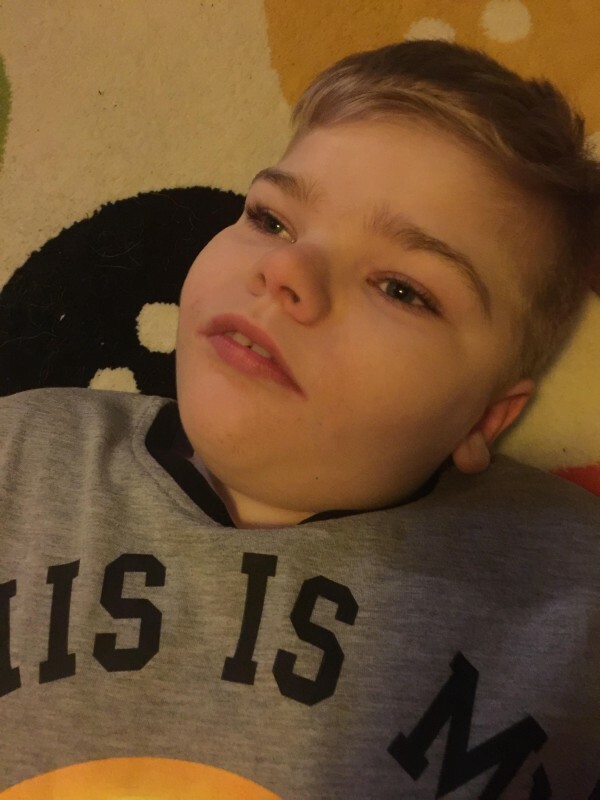 Due to the deprivation of oxygen at birth, James had a routine ultrasound brain scan which revealed small white patches at the sides of his brain and so was sent for a follow up MRI scan at 6 weeks. At 8 weeks old we received the results of his MRI which showed the white patches had gone but he had a smooth brain. We were told it was Lissencephaly but at the time we were told that they didn’t know what this meant.At 5 months old James began to have Infantile spasms (which is the infant form of epilepsy). Our GP referred us to Accident and Emergency at the Sick Children’s Hospital and they sent us for an EEG, which revealed his electrical brain activity. We then spoke to a consultant to whom I explained everything that had happened since James was born and she explained the details of James’s condition to us properly. Lissencephaly basically means that the brain is smooth, not completely but almost. The long term outcome of this condition varies from person to person. James is on the severe end of the scale but not the worst. James has global development delay. He also has epilepsy which for me is the hardest part of his whole situation – watching my baby have a fit is the most devastating thing I have ever seen. As a family we have decided it’s time for us to move on from Post Pals, we do genuinely appreciate everything you guys have done over the years it’s restored my faith that people do care and genuinely want to help and we as a family will be forever grateful for that. James is back having a rubbish time again. Poor boy is having plenty of seizures but we’re getting a plan together with the hospital and hopefully that’ll help. Otherwise he’s doing well, enjoying being back at school. James is doing fairly well apart from his thyroid levels have dropped again so they want to do more tests so will see what happens with that. Otherwise he is enjoying his holidays but I think missing school so only one full week till he’s back with all his friends! James is doing rather well at the moment we been slowly reducing one of his meds and he appears to have found his voice again and is shouting at us all day long lol thanks to everyone as always for the lovely gifts and cards as always it is very much appreciated. James has been doing well since his last hospital stay. He’s had seizures here and there, they’re horrible ones but not as many as we can sometimes have. Not long now till our summer holidays (Scottish kids finish at the end of June). We’re going for a break in a caravan for a week which we all can’t wait for. James is doing much better after his hospital stay!! However, seizures have been a bit yukky again. James is doing well, much happier and is more settled than he has been in a while, which is great for us! We are just taking everything one day at a time and enjoying a happier boy for however long he is happy! Thanks again for all the lovely cards and letters, they always means a lot!! James has been on fine form recently (waiting for the crash back to earth! ), but it’s nice to see him smiling and laughing again and being very naughty!! Thanks again for everything, it means so much to see my little man is so loved. James is doing ok, he’s still all over the place seizure wise and still very quiet. So we are going to make some more med changes (yes, more!) and see if we can get my happy boy back! I really don’t like seeing him so sad and miserable. Thanks, as always, for the lovely letters and gifts. It really does mean so much! Hi everyone. Things are so-so here. We are weaning James off phenytoin, which has been painful with lots and lots of seizures but we have managed to stay out of hospital, so that’s good! We are not any further forward as yet but now the phenytoin’s out the way we can move forward. I’ll keep you posted as and when we know more! Thank you all, as ever, for the generous amount of Christmas wishes and presents James received. There are no words to describe how grateful we truly are. Speaking of rough years, I’ve not really said much but here goes! The start of this year was a rubbish one for James. He had a hospital stay for a bad sickness bug, then shortly after he had another one due to rubbish amounts of seizures. Then we had an amazing once-in-a-lifetime trip to Florida celebrating our boy making double figures (a massive birthday for our lissencephaly warrior). Then when we got home he seemed to change – he became quiet, withdrawn and tired. My goodness was he tired – 10-30 minute naps every couple of hours, then sleeping all night! Puberty was mentioned several times but my Mummy instincts just weren’t convinced, so we kept nagging the hospital (my wonder was non convulsive status), so we began blood tests and scheduled an EEG. The blood tests showed an underactive thyroid, so more blood tests were done which confirmed a definite underactive thyroid so we were referred to endocrine doctors (yay more doctors/appointments) and they confirmed the under active thyroid. But not just the thyroid, the pituitary gland also (central hypothyroidism), so more tests (yippee)! A bone age scan (which is fine), cortisol levels, growth markers, and hormone markers which are all ok but not very high (so no puberty just yet) and a CT scan to look for abnormalities around the pituitary gland (again thankfully nothing there). So the upshot is we don’t know what’s wrong with the pituitary gland, but, so far, after several increases of the thyroxine medication James has been put on his level is still low and we don’t know why. There is a possibility that his pituitary gland is underdeveloped in line with his brain condition, but we are questioning his epilepsy meds after finding a small research paper suggesting some epilepsy drugs can increase/decrease thyroid function but we need to discuss this more with his neurologist who we see tomorrow! And, just in case that isn’t enough, the 20 minute EEG he had has revealed periods of non convulsive status, so James will be going back on steroids. But first (after yet another blood test) he needs the chicken pox vaccine as he has no immunity to it and steroids will leave him with no immune system whatsoever, and sadly we know that chicken pox can be fatal for kids on steroids!! But once he has had the vaccine it will be 3 months before we can start steroids ! So, yeah, that’s been our jam packed year! Still figuring out James’s issues. He is still tired a lot but after his EE we now know, on top of the existing issue, his EE is showing periods of non convulsive status. So, at some point soon, he will be going back on steroids but first we need to check his chicken pox immunity. His immune system will be non-existent on steroids and chicken pox can be serious if he was to catch them, so if he has no immunity to them he will need the vaccine, then we need to wait 3 months before we can start steroids. So it’s all fun and games over here. I’m sure he will be happy when he realises he’s going to be off school for six plus weeks whilst he is on the steroids. Though if last time is anything to go by it won’t be much fun for me or his Dad he was a very grumpy little man. Thank you all, as always, for everything. It means so much. James is back at school and seems to be happy enough. There’s still no change in his quietness and tiredness, but we have found the probable cause. I won’t say too much just now until we know a bit more, but lots of tests are to be done. We will be busy until we figure it all out, though hopefully it’s not too serious and manageable! Thank you all, as always, for your letters. James still isn’t great and is really quiet despite being off a certain medication, so we are back at the hospital in a couple of weeks and we will see what his doctor says. He did have some blood tests done and everything came back fine, but we’re still waiting on the vitamin levels results. I’m not sure what we’re going to do, but I think a 24 hour EEG is next to see how things are in his wee head. James is hanging in there, but we’re making more changes to meds due to him being so quiet and withdrawn. We’re unsure if the meds are the cause, but we will start there and then see where we are at. It’s breaking my heart seeing him so miserable. A huge thank you for our beautiful paper cuts, they are much appreciated. Thank you, as always, for all the letters and birthday cards for James. I can’t believe the boy is 10! It makes this mummy so emotional! James is doing ok but is very quiet. This is probably to do with seizures but medication changes are on the horizon so maybe that will help. Ok I said this would be a better update, so here it is! We took James to Florida and it was amazing! We met Mickey Mouse (4 of them! ), Minnie, Goofy, Donald, Daisy, Pluto, Elsa, Anna, Buzz, Woody and soooo many others! James was very well behaved despite lots of seizures. We also went on a safari at Busch gardens and got to feed leaves to giraffes which was brilliant. James even joined in! He also met Elmo and big bird at Busch gardens! We swam with dolphins which was amazing and James seemed to really enjoy it so much that he cried when it was over! It was a holiday of a lifetime making memories we will never forget. So other than that, James is well though we are still trying to get better control of seizures. Oh and soon my little baby turns 10! Can’t believe how fast the years have rolled by and how much of a big boy he is now (but still my little baby)! James is doing well but still up and down with seizures – isn’t he always! The next update will be better, I promise! Well February has been quite rubbish! Lots of nasty seizures landed James a stay in the hospital and a fourth med. He’s doing ok now, just back to his daily seizures, which isn’t great but beats the horrible clusters he had!! Other than that he is doing well. James has been well overall, though still has his seizures (as normal) and recently spent a few days in hospital with a nasty sickness bug. He is ok now and back to his usual cheeky self. Firstly, a huge thank you for all the cards and presents for James this Christmas, he was thoroughly spoilt!! And I mean spoilt!! So many lovely gifts! James has started the year in pretty good health despite his seizures increasing since the new med has settled in, but that’s just par for the course for James! We had a wonderful Christmas and on Hogmanay we went to his aunt’s wedding. After the New Year bells his daddy asked mummy to marry him!! James has been up and down and quite battered from his seizures. He ended up having an overnight stay in the hospital but he has started a new med so hopefully we will see a difference soon. James is not too great at the moment, he is having lots of yucky seizures so is going to see his doctor next week and see what steps we are going to take next. Fingers crossed we can find something to help. James has been very good lately and we are just back from a week in Tenerife which was amazing. James became poorly while we were there but after a visit from the doctor and some meds he was much better. James is doing well. A few seizures are creeping in and there’s an ongoing problem with his button, so he has started yet another med for his button. However, they are concerned it may be untreatable so we will wait to see what happens next. James is good in himself though. James has enjoyed the summer holidays and only has one full week left until he’s back at school. We are going away for a few days before he goes back and fingers crossed we have a good time. As always, thanks for the lovely cards and letters. James is doing well and he has just started his summer holidays. We’ve not decided what we are going to get upto yet though! Thank you so very much for all of James’ lovely birthday cards. We had a nice day with a trip to the safari park after school in the glorious sunshine. It was a great day, as always. James has been doing well health wise but seizures are creeping in. James is doing well. He had a short seizure free period though they are now creeping back in. So we just watch and wait and a plan is in place for a new med if we need to. It has been a rough few weeks with lots of yucky seizures and a really bad cold. Our poor boy has been off school for nearly 2 weeks but is now on the mend and we just need to sort these seizures. James is still having trouble with seizures and we are adjusting his meds again. It’s still too early for VNS to make a difference, but fingers crossed we get there. James recovered well after his vns operation on 15th January. It is too early to tell if it is helping seizures but it will get turned up on 7th February and then every month until we are seeing improvement, so fingers crossed. James is doing well though we are noticing an increase in seizures now clobazam has settled in his system, but we have a possible date of January 15th for his VNS operation. James is doing ok just now, he is back on clobazam to control his seizures and though still has all the little ones, the big ones are better. We are going in sometime after Christmas for an operation called a VNS to see if that will help long term with seizures. We are dreading it! James has been doing well though we’ve had another juggle of his meds (yet again). The next step is the VNS (vagal nerve stimulator) so we’re meeting with his consultant in a couple of weeks to discuss and get the ball rolling. We’re feeling kind of nervous but need to do what we can to help James in the long term. James has been doing reasonably well. He is back at school now and seems happy that he’s back with his teaching assistant from nursery (which is nice for them both as they both totally adore each other). James has been reasonably well but we had a scary weekend of seizures which landed him in hospital. He is now on his summer holidays and Edinburgh has been lovely so far and very hot. It is too hot for james to spend too much time outside but we got him a much needed new swing seat so he has been over the moon at getting out on that. James has been doing well and he is finally off his med, yippee! So we will see how he goes. James is keeping well overall, we’re still weaning off his med but it has been fairly smooth (a couple of rough days but nothing we can’t handle). We still have a few weeks to go until we’re off it completely so things could change. Otherwise, James is good and a happy bunny full of kisses and cuddles, so we’re a happy mummy and daddy. James has been fairly well. We are currently weaning off a medication (I know I keep saying that, but have to keep changing meds). So far it has been ok, but today hasn’t been so great as he has had 17 tonic clonics in an hour and both his rescue meds. We’re hoping it is not going to stay that bad until we try something else, but when it comes to epilepsy, who knows? Thank you for the lovely Easter cards and the lovely Christmas post that arrived, it is always lovely to be thought of by people and thank you especially to the little girl from America who wrote James a letter like she was writing to a rock star – such a sweet letter and it made James’s dad and I giggle. James is currently enjoying the iPad so if anyone knows any good apps that are easy for James to use, we would appreciate recommendations. James has been a little better and we’ve just had a lovely holiday in Lanzarote where James got to ride a jet ski!! We’ve still got lots of med changes to take place which we will now begin. James is doing well, though he did have a bad infection in his button, but we are finally getting it to clear. His seizures are still around but it is still early days with the med changes and still more to come. Otherwise he a happy bunny and thanks for our post. James did very well over Christmas and was in great spirits on Christmas day. Now it is time for all the med changes so we’re hoping 2013 isn’t overly dramatic. Thank you for all the beautiful cards and gifts sent to James over Christmas, it was very very sweet, as always. It’s been a hard month for James with a lot of seizures, a bad cold, and a hospital stay in the middle of changing meds, so we knew it would get tricky at some point. Everything is on hold now until after the new year to try and give him a break and avoid the hospital if possible. It’s all over the place for James just now, he’s having seizures big and small. My little lamb is having a rough time and there are lots of medicine changes to come so we’re just hoping that the weaning off doesn’t go badly. Thank you for the lovely Halloween package. James is still on a roller coaster of seizures and is at full dose of a new medicine and nothing has changed, so we’re back at hospital at end of this month and will probably begin weaning him off the new med. It is a bit annoying when we have just spent 6 months getting him on to it, but it is not working so it’s a case of needs must. James has been up and down lately and ended up in hospital overnight because of his awful seizures. He also spent the weekend at the hospice which was nice apart from the balloon in his button bursting! Thank you for all the lovely postcards, we’re going to get them all together in a frame for James’s bedroom wall. Thanks everyone, you are all so kind. It has been a weird month for James as he is still having rubbish seizures and we’re hoping this new med starts working soon. We’re getting ready for the summer holidays and are just hoping the weather holds up so we’re not stuck at home for 7 weeks, but we live in Scotland so we won’t be holding our breath! I just want to say a huge thank you to everyone at Post Pals for everything you do. James is doing well. We’re getting his room all decorated soon and can’t wait until it is all done and i get the rest of my house back – the boy has too much stuff! He is keeping pretty well, he has seizures here and there but nothing major. James had a great time at Rachel House Hospice and was spoilt rotten with compliments on what a handsome wee chap he is! Steve and I enjoyed it too and it was nice to have some relaxing family time. We are going to Derby this weekend to meet other families with a child with lissencephaly, so we’re excited about that. Poor James had an infection in his button site which ended in him having a small operation to remove the infection as the cream and antibiotics weren’t doing anything. He was a wee star and did amazingly well though and seems to have bounced back brilliantly. James’ health has been all over recently. We’ve had 5 weeks of constant bugs and have started a second medicine to help him sleep. It is currently taking 2-3 hours every night to get him to sleep which often results in James becoming very distressed. The new medicine isn’t doing much but it will be reviewed at the end of January along with his seizure medications, as i think it is time to change them to hopefully make things better for him. Other than that, we are going to be staying at Rachel House (which is a hospice) for a weekend every few months, so we’re looking forward to a bit of extra family support. James has been doing ok, although he has got a cold so has had a few seizures, a day off school, and loads and loads of cuddles. James has been doing ok lately. We enjoyed our trip to Skegness and James’ dad wants another weekend away at some point! Not sure where yet but we will see. James had an MRI recently so we’re waiting on the results, though it was more just for updated pictures of his brain, so fingers crossed nothing new shows up. James has been up and down with seizures, but nothing too major. We’re just getting ready to start our summer holidays so I’m hoping to get him out and about with his aunt and uncle. We’re really looking forward to our holiday in Skegness too and just hope the weather is good. Thank you everyone for the beautiful birthday cards James received and to Steph for the parcel of presents (so very sweet) thank you so much. James has had a good day despite the yucky seizures that have appeared over the last week. James has been doing ok but is going through a phase of a lot of screaming spells. We believe they are seizure related but par for the course with his brain condition and the type of epilepsy he has. He is otherwise doing well and looking forward to our holiday to Skegness in the summer. James loved the April showers picture of Dottie and I will get it framed and put up in his bedroom. I just wanted to say a big thanks for the Easter presents for James too as it was so sweet and generous. James has had an ok month this month, despite screaming spells coming and going and having tonic seizures in his sleep, but it is all manageable for the moment. I’m just hoping it is a little blip and not a sign of bigger seizures on their way. We are having lots of fun with the finger puppets, although I do have sore fingers! James has been ok. He has had another cold and so another week off school. It’s his second cold since November. Thankfully seizures have held off through it so far. Other than that he is doing great and is full of smiles and very cuddly, which mummy loves. Thanks for the lovely Dalmatian from Dottie who we named Oso and thanks for the very lovely sensory toys. We are very happy to be a part of Post Pals.